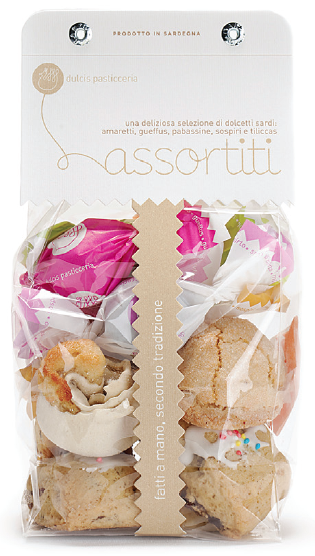 A delicious selection of Sardinian sweets: to sample all, to accompany tea or to taste a meal with coffee, with a Vernaccia di Oristano or a Malvasia di Bosa. Born from simple and traditional ingredients, such as almonds and raisins. They have the scent of the oven, orange blossom and holidays. 00 flour, sugar, sweet and bitter almonds, eggs, raisins, margarine (vegetable oils and fats, water, hydrogenated vegetable fat, emulsifier, salt, spices, citric acid), candied orange peel, sapa, apricot jam, cocoa, dark chocolate, baking powder, yeast, rum, liqueur myrtle, cinnamon, sugar, natural flavors.